I love fragrant lily-of-the-valley (Convallaria majalis). It’s one of the classic perennials of spring, but it really needs a frosty winter climate to do well. I never managed to get these bulb-like plants to flower in my Aucklandcity garden, but we get wicked frosts here in Hunua, so I might just have another crack at establishing a clump under some trees this year. You can get the dormant rhizomes in selected garden centres now, or wait until spring for plants (look in the perennial section at your local garden centre), or check Trade Me for plants sold by hobby growers. Parva Plants also have an adorable pale pink-flowered form (Convallaria majalis var. rosea) but – drats – it has sold out for the season. With all the “here take this for a minute” handling of the bouquet while Kate made various adjustments, a larger one would have probably been wrecked. 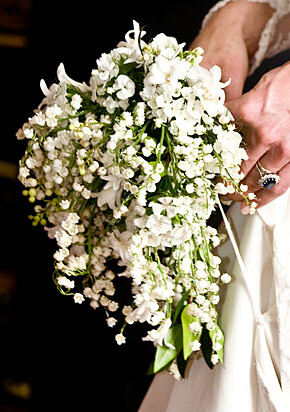 Also the flowers carried special symbolism for her and Will and the small bouquet didn’t detract from the dress. I also agree with an interviewed dress designer who said that the dress had been intelligently designed. Can’t wait for the next royal wedding…………………………….. Thanks for looking that up for us … I just love all the meaning in such a small bouguet! Good luck with the arrival of your little one!! I have a 3 1/2 month little girl Khloe and she just loves being in her pram in the garden which is such a blessing as I couldn’t wait to get out back into it!! Thank you, I was not aware of the significance of all the flowers, they certainly covered all to help through the years of trial and tribulations, these actually come with a loving marriage and builds it to grown strong. I know this after our 50 years. I thought it was beautiful, meaningful and so suited her dress – I think it is very much a personal thing – some brides want big fussy bunches, others a single rose .. . I loved Kate’s bouquet. I feel ,with her fitted bodice and tiny figure, a large boquet would have looked out of place. The meanings of each chosen flower is lovely. The whole wedding party looked lovely, and not over done. All so ‘natural ‘. (Loved the look on Harry’s face as he turned and commented to Will’s about Kate approaching !!) We wish them years of happiness.